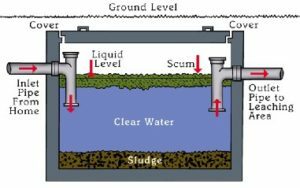 A septic system is your very own on-site sewage treatment facility and is generally trouble free if you understand how it works and follow a few simple rules. Leaking and poorly maintained septic systems release nutrients and pathogens (bacteria and viruses) that can be picked up by stormwater and discharged into nearby waterways. Pathogens can cause public health problems and environmental concerns. Sewage and grey water from the house flow through sewer pipes into the tank, where bacteria break down raw sewage into sludge and water, and the water continues to flow into a gravel leach field. Bacteria break down the solids in the tank but they need to be pumped out periodically. Pump your tank out as necessary (generally every 3 to 5 years), and have your system inspected every 3 years. Use septic safe products, such as dish soap, hand soap, and toilet paper. Avoid using excessive amounts of chemicals and do not dispose of household hazardous waste in sinks or toilets. Do not pour grease or fats down your kitchen sink, as they solidify and can cause a blockage in the system. Do not flush anything that is non-biodegradable such as diapers, feminine hygiene products, cigarette butts, cat litter, facial tissues, and paper towels. Conserve water. 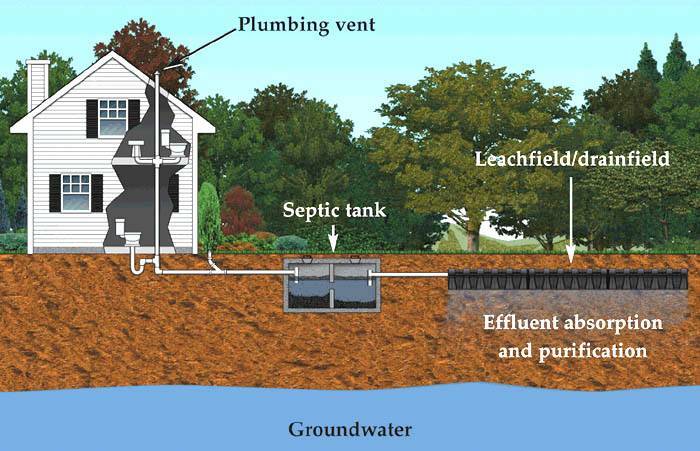 A septic tank can only handle a limited amount of water at once, as it needs time to separate the solids and liquids, and send liquids to a leach field. Don't run continuous loads of laundry in one day. Spread it out over a few days to give your tank a chance to recover. Don't place anything heavy on your septic tank, like a shed, swimming pool, parked car or RV. The weight of these objects can damage the tank, pipes and leach field. Keep the leach field clear of trees and shrubs, as the roots can damage pipes and the tank. Avoid garbage disposals, as they can clog the leach field and increase the frequency of needing to get your tank pumped. Feed the good bacteria in the septic system. Flush a liter of spoiled buttermilk down the toilet once every few months. It's important to maintain your septic system to prevent leaks, avoid costly clean-out and repairs, and stop stormwater pollution. A septic tank is an enclosed container manufactured from concrete, fiberglass or plastic and is buried in the yard.